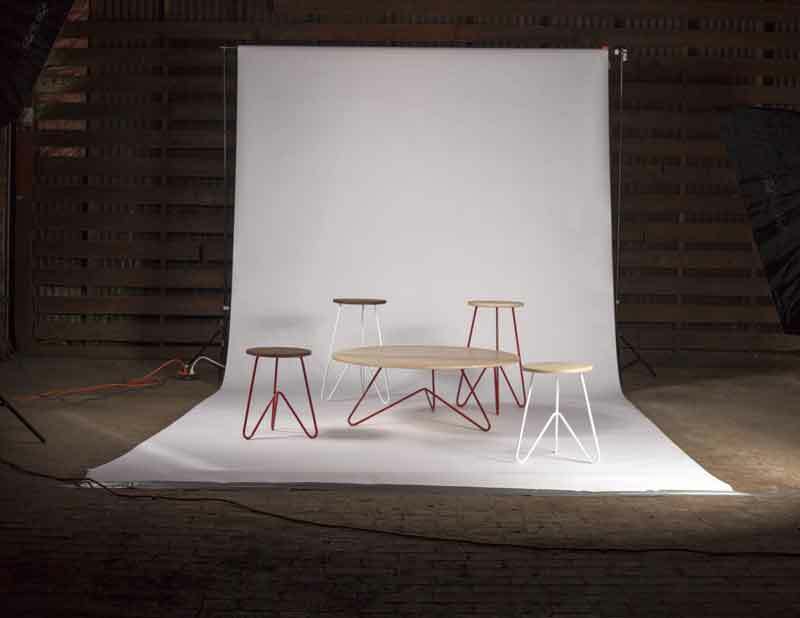 Three young furniture designers in Cincinnati are making their mark. Here are their stories. How does a man with a law degree become a furniture designer? It was a gradual process for Matthew C. Metzger, now 31, who made the transition from three years as a lawyer at top rated Keating, Muething and Klekamp law firm to designing mostly contemporary furniture out of a shop in Maineville, Ohio. His inspiration came from his father who made furniture as a hobby. Now, it has become his full-time job with pieces ranging from $250 to $17,000. 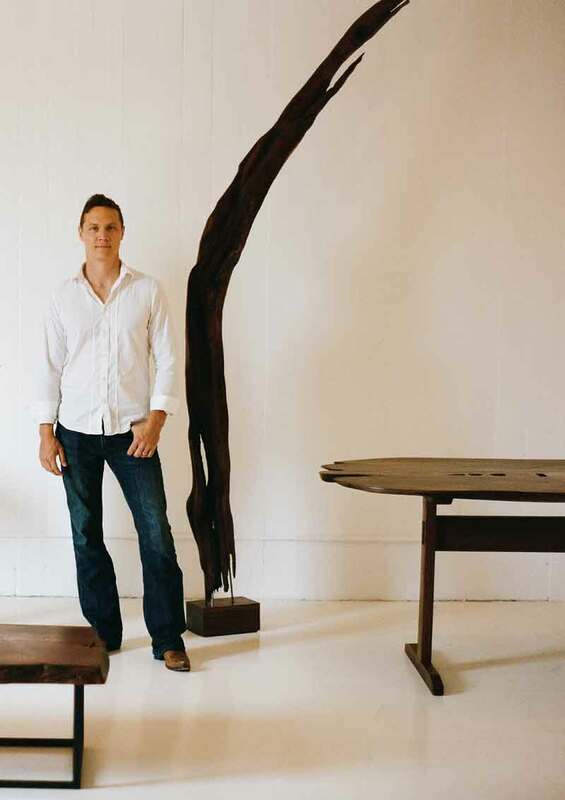 Self-taught, Metzger has created a niche for himself in the Cincinnati area with his furniture, paintings and sculpture – although he hopes to break into the Chicago market in the future. Interestingly, he graduated from the University of Iowa in 2004 on a gymnast scholarship with a creative writing certificate, a major in economics and a minor in philosophy. Always one with a curiosity to explore different areas, Metzger has an interdisciplinary mind. He now also writes for aeqai. In his own words, he ended up in law school because he wasn’t sure what he wanted to do. 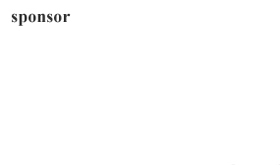 Still licensed to practice law, he spends five hours per week in that area. Finding a law practice not the right fit for him, he started doing furniture and sculpture. With his wife Lisa, 33, who works at Fifth Third Bank, he has one son Bo, age 13 months and is expecting another child next year. Residing in Silverton, Metzger works out of his office in Maineville. There were no books or mentors that guided Metzger in the design process. He learned by doing and views his craft as an art form. “It can be more sculptural,” he says of the designs. He describes them as graceful, elemental, organic, fluid and timeless. Although many of his pieces look modern and minimalist, Metzger has also done pieces that are more traditional. He often chooses walnut to work with because that’s the wood his customers request most. Trees are sourced by log buyers and brought to his shop where they are dried for two to three years before being fabricated into furniture. So, the process begins before the design. The amount of work and time involved is reflected in the prices. “As an artist, you want to be making a statement,” Metzger comments. He cites the guru of furniture making, George Nakashima, a Japanese-American woodworker, architect and furniture maker, who was one of the leading innovators of 20thcentury design during his lifetime (1905 – 1990) and after his death. Much of Metzger’s work is commissioned; the other portion is speculative. Currently, his work is shown at Voltage Galleries in Oakley; his paintings can be seen at Miller Gallery in Hyde Park. In his design process, he says, “It really does start with the material – the shape and size.” When clients come to him, he shows them samples of his previous work, but he works collaboratively with them if they have an idea. His customer base is mainly residents of Hyde Park in Cincinnati, many of whom have become his friends as well as clients. As a custom designer, Metzger takes 20 to 30 hours to build a table, with a two-month waiting time. He uses a work bench and hand tools, but not CAD (computer-aided design). He has a refined, primitive look and draws from the Shaker line, for example, emphasizing elements of simplicity and minimalism. He lets the material speak for itself. “Our furniture will last 500 years if cared for properly. And our designs won’t go out of style,” he says. Through word of mouth, Metzger has acquired repeat customers who delight in his designs. His shop is not meant for production run furniture. And, he prides himself on authentic and tactile work. While many of his pieces are rectangular, he has gravitated to creating circular objects which require more skill and time. Empty nesters who are downsizing often look for modern, clean lines to fit with their new style. They buy a piece designed by Metzger that will hold a room. “The furniture is consistent with a lifestyle where we live as part of our environment, not as a ruler over it,” he remarks. Another active furniture designer in town is Zach Darmanian-Harris, director of industrial design, at Peanut Butter& Jelly Co. (PB&J), a public relations and graphic design company, which merged with Such + Such, a furniture brand. Located at 1417 Main St. in the heart of Over-the-Rhine, PB&J offers unique and modern furniture designs for its customers. Clients often visit this shop to view samples of the work and view a portfolio. Some of their pieces include chairs, tables, signs, stools and clocks. Digital fabrication is often used to craft a piece with routers. A graduate of industrial design in 2010 from University of Cincinnati’s Design Art Architecture and Planning (DAAP), Darmanian-Harris actually did his senior thesis on Such + Such so he was familiar with that organization. Professor Steve Doehler at DAAP encouraged him to pursue the furniture design field. As a result, he took a design entrepreneur class. His relatively young career has included working with Such + Such and then with the merged PB&J, which now has a total of 12 employees. The company has expanded its reach to work on restaurant interiors and tradeshow booths in addition to commercial projects. Prices range from stools at $250, coffee table in maple at $650 and other projects at $10,000. Business has been good for PB&J: growth has doubled in 2013. Every piece is made on commission and built in the local facility. Customers have included bars, restaurants, Carl Solway Gallery, Lavomatic, Sloane Boutique as well as large corporations. Word of mouth and the website www.suchandsuchsite.com has expanded their business along with Facebook, blog and a social media presence. Designs often come from basic geometry and simple shapes. Other inspirations originate from visiting design shows. Even a backpacking trip at the Red River Gorge with its stunning rock formation has inspired furniture designs. Darmanian-Harris’ project level is five at a time. An unusual piece is a walnut bearskin rug modeled in 3-D selling for $18,000. The thought process behind industrial design is complex with a number of key elements feeding into the eventual product. In addition to Darmanian-Harris and Metzger, there is Hayes Shanesy, 32, who began designing his own work early in his lifetime. As a child, he was encouraged to pursue art and drew frequently. Steve Shanesy, his father, is a master cabinetmaker and former editor of Popular Woodworking Magazine, who helped Shanesy build pieces in his early years. Trained as an industrial designer, Shanesy studied at UC’s DAAP where he designed and built furniture. 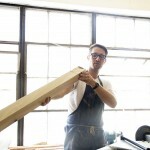 After graduation in 2004, he worked as a carpenter and musician before founding his firm Brush Factory design studio with his partner Rosie Kovacs in 2009. 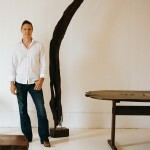 Since then, he has designed and built many custom pieces including furniture, cabinets and fixtures. 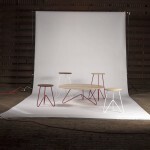 Drawn to furniture design, Shanesy enjoys the possibility of design and fabrication of his own work. 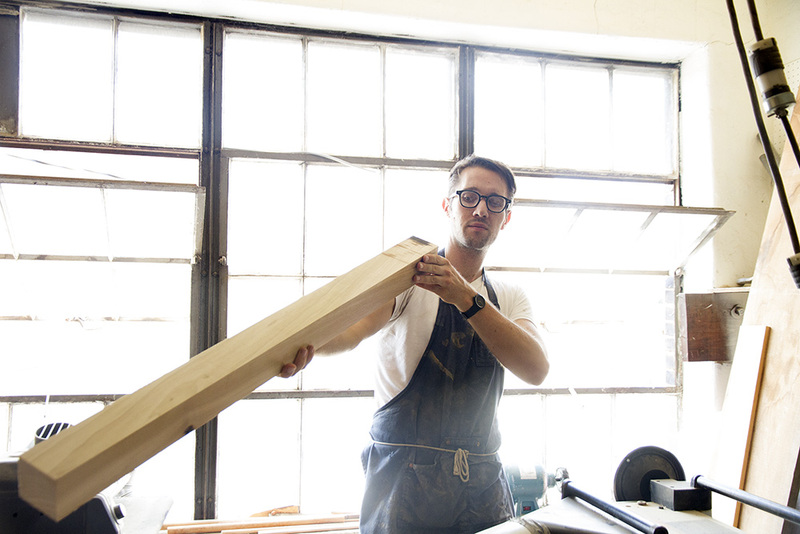 While most product design, including furniture, is mass produced, other people like Shanesy prefer to oversee and labor over his individual designs into production. “Furniture provides quite a lot of utility and solves functional problems while leaving considerable room for aesthetics and craft,” comments Shanesy. “It is also one of the few practices where wood is a primary raw material. Wood is wonderful, sustainable and a natural resource that draws in humans.” He considers his work contemporary. One doesn’t need to go to New York or Chicago to see state-of-the-art modern furniture. It’s right here in Cincinnati. These three designers represent current trends completely and authentically.